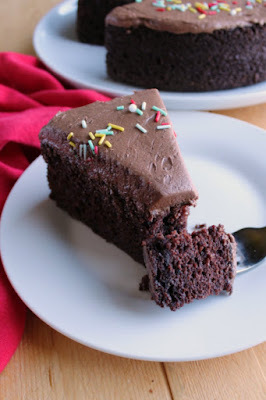 Rich and moist chocolate mayonnaise cake with simple chocolate frosting in a smaller size. It's a perfect dessert for a small party or just because! This post is sponsored by Door County Coffee and Taste of Home. As always, all opinions are honest and my own. It will be love at first bite with this chocolate mayonnaise cake. The batter is easy to whip up and the results are moist and delicious. Add a smattering of chocolate frosting to seal the deal. It's the perfect treat to enjoy with a cup of coffee and a friend or two! 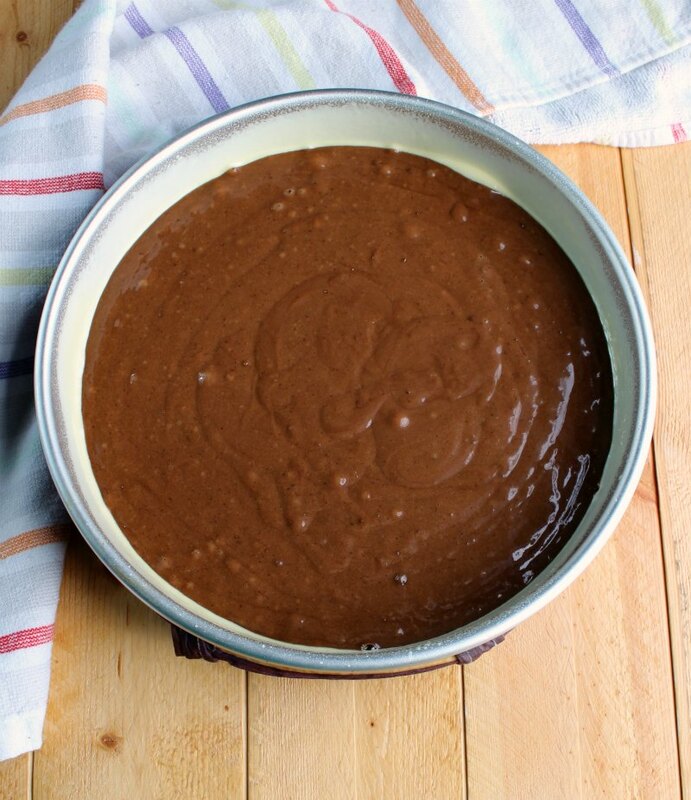 Nothing says vintage goodness like a chocolate mayonnaise cake. It just begs you to take a bite. I have been tempted to make a chocolate mayonnaise cake for quite some time. Mostly because I have been wanting to make a Potillo's inspired chocolate cake. However all of the recipes I found use a cake mix version of a mayonnaise cake and a couple of tubs of frosting. Now I have been known to reach for a cake mix occasionally. 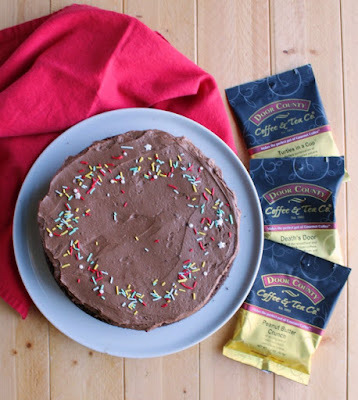 I have some great doctored up cake mix recipes on the blog already. But canned frosting?! That is where I draw the line. Frosting is so easy to make yourself and so much more delicious when you do! 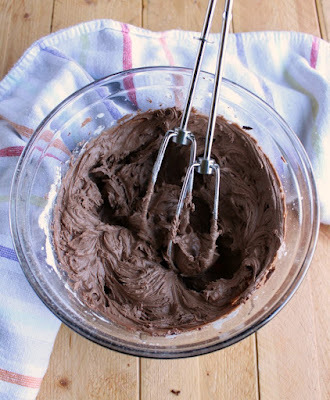 (You can learn a bit more about all kinds of frosting in my Frosting 101 primer!) 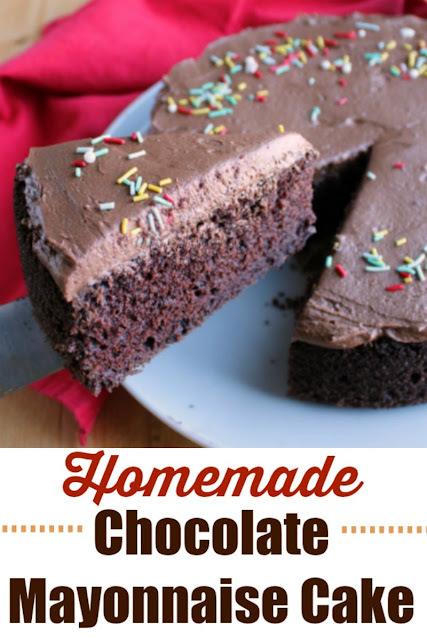 So I was delighted to find a chocolate mayonnaise cake recipe on the Taste of Home website. A quick read through the recipe and I knew I had a winner. The batter comes together in just a couple of minutes and with ingredients I always have on hand. 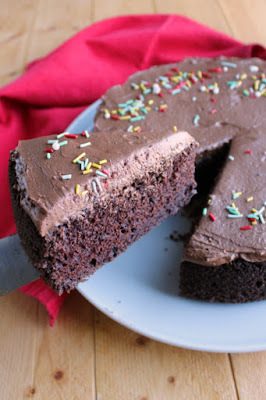 This recipe is the perfect amount to make a one layer 9" cake and enough chocolate frosting to top it. The smaller size helped me to not have to polish off too much leftover cake. Not that I would have minded necessarily, but my wasteline appreciated the forced control! I did make a couple of small adjustments to the recipe. The first was to replace the water with cooled brewed coffee. Adding a touch of coffee to chocolate recipes does so much to help the flavor. It doesn't taste like coffee, it just gives the chocolate a nice boost. The second was reducing the baking powder just a smidge. The comments on the recipe suggested the amount called for was a bit much. With the little extra acidity from the coffee, I was sure what I did add was going to be activated nicely. So I felt confident in using the smaller amount and still getting plenty of spring in the cake. The frosting recipe gave me a bit of pause at first. Two tablespoons of butter?! You know I am a more frosting is better kind of girl, so I was really tempted to double the recipe. But in the end logic won me over. I couldn't crow about the virtuous nature of the smaller size and then double the frosting. The amount as written is plenty to cover the top of the cake. Which works out well as this is a cake you could easily serve out of the cake pan or an 8" square casserole dish. Though if you want enough to cover the side and top of the cake, I would recommend going ahead and making the extra. I sat down to try a slice with a cup of Door County Coffee and definitely found my happy place. They sent me so many delicious flavors, it was hard to pick one to try first! My husband was really excited about the blueberry cobbler coffee and the blackberry shortcake was calling my name. We've tried quite a few now and have enjoyed them all! Little Dude enjoyed his without the extra coffee. He did something uncharacteristic for him, and immediately asked for a second piece! If you have never tried a chocolate mayonnaise cake, this seems like the perfect time to give it a go. If you have, this is your excuse to have it again! Do you have any vintage dessert recipes you love? Maybe something your grandma used to make... I'd love to hear all about it! Preheat oven to 350 F and grease a round 9" cake pan or a square casserole dish. In a mixing bowl, beat together mayonnaise, sugar and vanilla until incorporated. 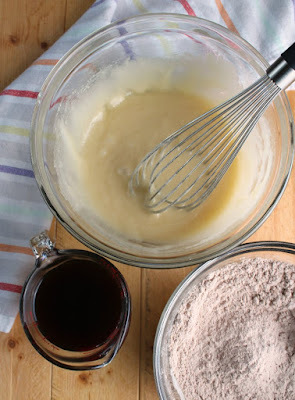 In another bowl, whisk together flour, cocoa powder, baking soda and salt until combined and lump free. Mix half of the dry ingredients into the mayonnaise mixture. Then stir in the coffee. Add the remaining dry ingredients and mix until just incorporated. Pour into prepared baking dish. Bake for 25-30 minutes or until the cake springs back when lightly touched with your finger. Beat the butter until smooth. Add the remaining ingredients and beat well. Spread over cooled cake and decorate with sprinkles if desired. It's so funny, I was just thinking about trying a chocolate mayonnaise cake over the weekend. Looking at your pictures, I know I need to try it sooner rather than later--I can't believe how rich and chocolatey it is! I LOVE chocolate mayonnaise cake. My grandfather was making this before I was born, for over 50 years. It is so moist and one would never know it has mayo in it! This cake looks so moist and delicious! And how fun that you used mayonnaise in this recipe. Mmmm This cake wouldn't last 5 minutes in my house! It's been a long time since I've made a chocolate mayonnaise cake. This looks delicious! My husband loves blueberry coffee too. 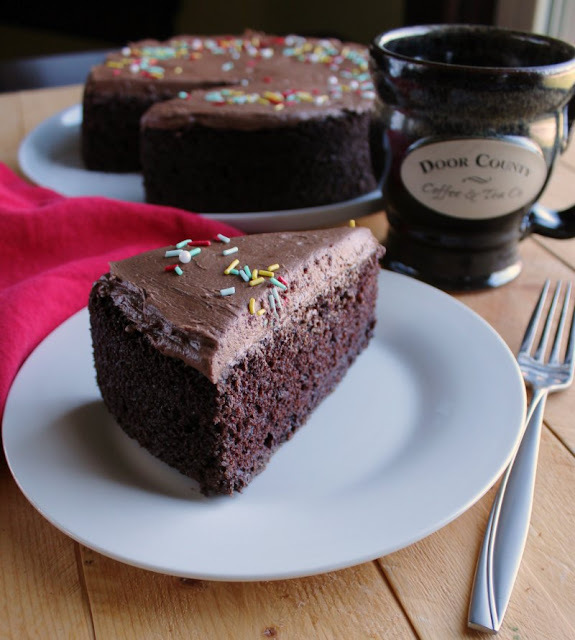 I love using coffee in my chocolate baked goods. This cake looks insanely moist and yummy! Perfect with a cup of coffee.